Light has the ability to create visual compositions that can be dramatic, harmonious and romantic. It helps blend interior and exterior spaces, making your home feel larger. Investing in a well designed, professionally installed Landscape Lighting System is the one investment that encompasses time, beauty, safety and security. Exterior Lighting Services for Charlotte, North Carolina. How would you like to increase your living space? Increase your living environment as much as your want with landscape lighting. Divine Lightscapes understand that a well thought-out lighting portrait blends interior living spaces with exterior ones and vice-versa. The interior does not overshadow the exterior, but rather they each accentuate and balance one another to create harmonious cohesion and a sense of continuous space. 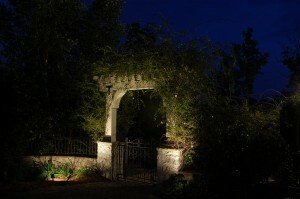 Make the night come alive with exterior landscape lighting! Enhance the beauty of your home and landscape with a Divine Lightscapes. The philosophy behind every Divine Lightscapes project is to create a unique and inviting environment that complements your lifestyle, accentuates your surroundings and provides you with overall beauty. Increase ‘curb appeal’ and enhance the overall architecture of your home with landscape lighting. Investing in a Divine Lightscapes project is not simply icing on the cake; it is the one feature that increases the value of your home while allowing you to spend more time outdoors enjoying your investment.